Tim Silver‘s exhbition at the Centre for Contemporary Photography has the curious title Oneirophrenia. It’s a medical term for the hallucinatory state caused by sleep deprivation or drugs. His series of photographs certainly point to a nightmare since the plaster busts, which have been cast from his own head, are bursting apart with bread. Silver’s curious method is to fill the casts with dough and bake them; as the dough rises it expands and cracks the heads apart. They’re like a surrealist depiction of madness. The casts resemble classical busts, an index of order and harmony, while the bursting bread points to the unruly unconscious mind, what Freud named the id. In the contrast of hard plaster and soft bread there is a satisfying opposition of mineral and vegetable, or of idea and matter. The bread has a strange resemblance to the shape of the brain, but the brains in these pictures are out of order and out of control. Silver often uses organic or entropic materials which degrade and change form over time, including wax crayon, putty, fairy floss and chocolate. 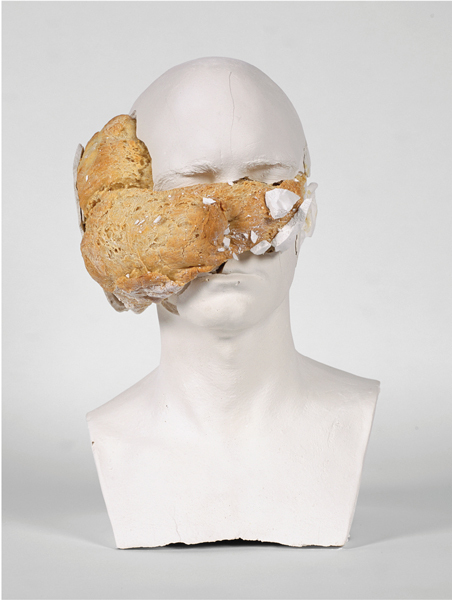 Here the artist has packed his heads with bread dough, which, as it rises, ruptures through his plaster skin, fracturing the classical forms with unique and random mutations of matter.